"Ham radio" redirects here. For other uses, see Ham radio (disambiguation). The origins of amateur radio can be traced to the late 19th century, but amateur radio as practiced today began in the early 20th century. The First Annual Official Wireless Blue Book of the Wireless Association of America, produced in 1909, contains a list of amateur radio stations. This radio callbook lists wireless telegraph stations in Canada and the United States, including 89 amateur radio stations. As with radio in general, amateur radio was associated with various amateur experimenters and hobbyists. Amateur radio enthusiasts have significantly contributed to science, engineering, industry, and social services. Research by amateur operators has founded new industries, built economies, empowered nations, and saved lives in times of emergency. Ham radio can also be used in the classroom to teach English, map skills, geography, math, science, and computer skills. The term "ham" was first a pejorative term used in professional wired telegraphy during the 19th century, to mock operators with poor Morse code sending skills ("ham-fisted"). This term continued to be used after the invention of radio and the proliferation of amateur experimentation with wireless telegraphy; among land- and sea-based professional radio operators, "ham" amateurs were considered a nuisance. The use of "ham" meaning "amateurish or unskilled" survives today in other disciplines ("ham actor"). The amateur radio community subsequently began to reclaim the word as a label of pride, and by the mid-20th century it had lost its pejorative meaning. Although not an acronym, it is often mistakenly written as "HAM" in capital letters. Amateur radio operators use various modes of transmission to communicate. The two most common modes for voice transmissions are frequency modulation (FM) and single sideband (SSB). FM offers high quality audio signals, while SSB is better at long distance communication when bandwidth is restricted. Radiotelegraphy using Morse code, also known as "CW" from "continuous wave", is the wireless extension of landline (wired) telegraphy developed by Samuel Morse and dates to the earliest days of radio. Although computer-based (digital) modes and methods have largely replaced CW for commercial and military applications, many amateur radio operators still enjoy using the CW mode—particularly on the shortwave bands and for experimental work, such as earth-moon-earth communication, because of its inherent signal-to-noise ratio advantages. Morse, using internationally agreed message encodings such as the Q code, enables communication between amateurs who speak different languages. It is also popular with homebrewers and in particular with "QRP" or very-low-power enthusiasts, as CW-only transmitters are simpler to construct, and the human ear-brain signal processing system can pull weak CW signals out of the noise where voice signals would be totally inaudible. A similar "legacy" mode popular with home constructors is amplitude modulation (AM), pursued by many vintage amateur radio enthusiasts and aficionados of vacuum tube technology. Demonstrating a proficiency in Morse code was for many years a requirement to obtain an amateur license to transmit on frequencies below 30 MHz. Following changes in international regulations in 2003, countries are no longer required to demand proficiency. The United States Federal Communications Commission, for example, phased out this requirement for all license classes on 23 February 2007. Modern personal computers have encouraged the use of digital modes such as radioteletype (RTTY) which previously required cumbersome mechanical equipment. Hams led the development of packet radio in the 1970s, which has employed protocols such as AX.25 and TCP/IP. Specialized digital modes such as PSK31 allow real-time, low-power communications on the shortwave bands. EchoLink using Voice over IP technology has enabled amateurs to communicate through local Internet-connected repeaters and radio nodes, while IRLP has allowed the linking of repeaters to provide greater coverage area. Automatic link establishment (ALE) has enabled continuous amateur radio networks to operate on the high frequency bands with global coverage. Other modes, such as FSK441 using software such as WSJT, are used for weak signal modes including meteor scatter and moonbounce communications. Fast scan amateur television has gained popularity as hobbyists adapt inexpensive consumer video electronics like camcorders and video cards in PCs. Because of the wide bandwidth and stable signals required, amateur television is typically found in the 70 cm (420–450 MHz) frequency range, though there is also limited use on 33 cm (902–928 MHz), 23 cm (1240–1300 MHz) and higher. These requirements also effectively limit the signal range to between 20 and 60 miles (30–100 km). Linked repeater systems, however, can allow transmissions of VHF and higher frequencies across hundreds of miles. Repeaters are usually located on heights of land or tall structures and allow operators to communicate over hundreds of miles using hand-held or mobile transceivers. Repeaters can also be linked together by using other amateur radio bands, landline, or the Internet. Amateur radio satellites can be accessed, some using a hand-held transceiver (HT), even, at times, using the factory "rubber duck" antenna. Hams also use the moon, the aurora borealis, and the ionized trails of meteors as reflectors of radio waves. Hams can also contact the International Space Station (ISS) because many astronauts and cosmonauts are licensed as amateur radio operators. Amateur radio operators use their amateur radio station to make contacts with individual hams as well as participating in round table discussion groups or "rag chew sessions" on the air. Some join in regularly scheduled on-air meetings with other amateur radio operators, called "nets" (as in "networks"), which are moderated by a station referred to as "Net Control". Nets can allow operators to learn procedures for emergencies, be an informal round table, or cover specific interests shared by a group. Amateur radio operators, using battery- or generator-powered equipment, often provide essential communications services when regular channels are unavailable due to natural disaster or other disruptive events. Many amateur radio operators participate in radio contests, during which an individual or team of operators typically seek to contact and exchange information with as many other amateur radio stations as possible in a given period of time. In addition to contests, a number of Amateur radio operating award schemes exist, sometimes suffixed with "on the Air", such as Summits on the Air, Islands on the Air, Worked All States and Jamboree on the Air. Radio transmission permits are closely controlled by nations' governments because radio waves propagate beyond national boundaries, and therefore radio is of international concern. Also, radio has possible clandestine uses. Both the requirements for and privileges granted to a licensee vary from country to country, but generally follow the international regulations and standards established by the International Telecommunication Union and World Radio Conferences. All countries that license citizens to use amateur radio require operators to display knowledge and understanding of key concepts, usually by passing an exam. The licenses grant hams the privilege to operate in larger segments of the radio frequency spectrum, with a wider variety of communication techniques, and with higher power levels relative to unlicensed personal radio services (such as CB radio, FRS, and PMR446), which require type-approved equipment restricted in mode, range, and power. Amateur licensing is a routine civil administrative matter in many countries. Amateurs therein must pass an examination to demonstrate technical knowledge, operating competence, and awareness of legal and regulatory requirements, in order to avoid interfering with other amateurs and other radio services. A series of exams are often available, each progressively more challenging and granting more privileges: greater frequency availability, higher power output, permitted experimentation, and, in some countries, distinctive call signs. Some countries, such as the United Kingdom and Australia, have begun requiring a practical assessment in addition to the written exams in order to obtain a beginner's license, which they call a Foundation License. In most countries, an operator will be assigned a call sign with their license. In some countries, a separate "station license" is required for any station used by an amateur radio operator. Amateur radio licenses may also be granted to organizations or clubs. In some countries, hams were allowed to operate only club stations. An amateur radio license is valid only in the country in which it is issued or in another country that has a reciprocal licensing agreement with the issuing country. Some countries, such as Syria and Cuba, restrict operation by foreigners to club stations only. In some countries, an amateur radio license is necessary in order to purchase or possess amateur radio equipment. Amateur radio licensing in the United States exemplifies the way in which some countries award different levels of amateur radio licenses based on technical knowledge: three sequential levels of licensing exams (Technician Class, General Class, and Amateur Extra Class) are currently offered, which allow operators who pass them access to larger portions of the Amateur Radio spectrum and more desirable (shorter) call signs. An exam, authorized by the Federal Communications Commission (FCC), is required for all levels of the Amateur Radio license. These exams are administered by Volunteer Examiners, accredited by the FCC-recognized Volunteer Examiner Coordinator (VEC) system. The Technician Class and General Class exams consist of 35 multiple-choice questions, drawn randomly from a pool of at least 350. To pass, 26 of the 35 questions must be answered correctly. The Extra Class exam has 50 multiple choice questions (drawn randomly from a pool of at least 500), 37 of which must be answered correctly. The tests cover regulations, customs, and technical knowledge, such as FCC provisions, operating practices, advanced electronics theory, radio equipment design, and safety. Morse Code is no longer tested in the U.S. Once the exam is passed, the FCC issues an Amateur Radio license which is valid for ten years. Studying for the exam is made easier because the entire question pools for all license classes are posted in advance. The question pools are updated every four years by the National Conference of VECs. Prospective amateur radio operators are examined on understanding of the key concepts of electronics, radio equipment, antennas, radio propagation, RF safety, and the radio regulations of the government granting the license. These examinations are sets of questions typically posed in either a short answer or multiple-choice format. Examinations can be administered by bureaucrats, non-paid certified examiners, or previously licensed amateur radio operators. The ease with which an individual can acquire an amateur radio license varies from country to country. In some countries, examinations may be offered only once or twice a year in the national capital and can be inordinately bureaucratic (for example in India) or challenging because some amateurs must undergo difficult security approval (as in Iran). Currently only Yemen and North Korea do not issue amateur radio licenses to their citizens, although in both cases a limited number of foreign visitors have been permitted to obtain amateur licenses in the past decade. Some developing countries, especially those in Africa, Asia, and Latin America, require the payment of annual license fees that can be prohibitively expensive for most of their citizens. A few small countries may not have a national licensing process and may instead require prospective amateur radio operators to take the licensing examinations of a foreign country. In countries with the largest numbers of amateur radio licensees, such as Japan, the United States, Thailand, Canada, and most of the countries in Europe, there are frequent license examinations opportunities in major cities. Granting a separate license to a club or organization generally requires that an individual with a current and valid amateur radio license who is in good standing with the telecommunications authority assumes responsibility for any operations conducted under the club license or club call sign. A few countries may issue special licenses to novices or beginners that do not assign the individual a call sign but instead require the newly licensed individual to operate from stations licensed to a club or organization for a period of time before a higher class of license can be acquired. A reciprocal licensing agreement between two countries allows bearers of an amateur radio license in one country under certain conditions to legally operate an amateur radio station in the other country without having to obtain an amateur radio license from the country being visited, or the bearer of a valid license in one country can receive a separate license and a call sign in another country, both of which have a mutually-agreed reciprocal licensing approvals. Reciprocal licensing requirements vary from country to country. Some countries have bilateral or multilateral reciprocal operating agreements allowing hams to operate within their borders with a single set of requirements. Some countries lack reciprocal licensing systems. When traveling abroad, visiting amateur operators must follow the rules of the country in which they wish to operate. Some countries have reciprocal international operating agreements allowing hams from other countries to operate within their borders with just their home country license. Other host countries require that the visiting ham apply for a formal permit, or even a new host country-issued license, in advance. The reciprocal recognition of licenses frequently not only depends on the involved licensing authorities, but also on the nationality of the bearer. As an example, in the US, foreign licenses are recognized only if the bearer does not have US citizenship and holds no US license (which may differ in terms of operating privileges and restrictions). Conversely, a US citizen may operate under reciprocal agreements in Canada, but not a non-US citizen holding a US license. An amateur radio operator uses a call sign on the air to legally identify the operator or station. In some countries, the call sign assigned to the station must always be used, whereas in other countries, the call sign of either the operator or the station may be used. In certain jurisdictions, an operator may also select a "vanity" call sign although these must also conform to the issuing government's allocation and structure used for Amateur Radio call signs. Some jurisdictions require a fee to obtain such a vanity call sign; in others, such as the UK, a fee is not required and the vanity call sign may be selected when the license is applied for. The FCC in the U.S. discontinued its fee for vanity call sign applications in September 2015. 1 – Gives the subdivision of the country or territory indicated in the first part (this one refers to the Western Cape). NAT – The final part is unique to the holder of the license, identifying that station specifically. Many countries do not follow the ITU convention for the numeral. In the United Kingdom the original calls G0xxx, G2xxx, G3xxx, G4xxx, were Full (A) License holders along with the last M0xxx full call signs issued by the City & Guilds examination authority in December 2003. Additional Full Licenses were originally granted to (B) Licensees with G1xxx, G6xxx, G7xxx, G8xxx and 1991 onward with M1xxx callsigns. The newer three-level Intermediate License holders are assigned 2E0xxx and 2E1xx, and the basic Foundation License holders are granted call signs M3xxx or M6xxx. Instead of using numbers, in the UK the second letter after the initial ‘G’ identifies the station’s location; for example, a callsign G7OOE becomes GM7OOE when that license holder is operating a station in Scotland. Prefix "GM" is Scotland, G or GE is England (the ‘E’ may be omitted), and "GW" is Wales. More information is available from the UK Radio & Media Licensing Authority (Ofcom) website. In the United States, for non-vanity licenses, the numeral indicates the geographical district the holder resided in when the license was first issued. Prior to 1978, US hams were required to obtain a new call sign if they moved out of their geographic district. In Canada, call signs start with VA, VE, VY, VO, and CY. Call signs starting with 'V' end with a number after to indicate the political region; prefix CY indicates geographic islands. Prefix VA1 or VE1 is Nova Scotia, VA2 / VE2 is Quebec, VA3 / VE3 is Ontario, VA4 / VE4 is Manitoba, VA5 / VE5 is Saskatchewan, VA6 / VE6 is Alberta, VA7 / VE7 is British Columbia, VE8 is the Northwest Territories, VE9 is New Brunswick, VY0 is Nunavut, VY1 is Yukon, VY2 is Prince Edward Island, VO1 is Newfoundland, and VO2 is Labrador. CY is for amateurs operating from Sable Island (CY0) or St. Paul Island (CY9), both of which require Coast Guard permission to access. The last two or three letters of the callsigns are typically the operator's choice (upon completing the licensing test, the ham writes three most-preferred options). Two letter callsign suffixes require a ham to have already been licensed for 5 years. Callsigns in Canada can be requested with a fee. Also, for smaller geopolitical entities, the numeral may be part of the country identification. For example, VP2xxx is in the British West Indies, which is subdivided into VP2Exx Anguilla, VP2Mxx Montserrat, and VP2Vxx British Virgin Islands. VP5xxx is in the Turks and Caicos Islands, VP6xxx is on Pitcairn Island, VP8xxx is in the Falklands, and VP9xxx is in Bermuda. Online callbooks or callsign databases can be browsed or searched to find out who holds a specific callsign. An example of an online callbook is QRZ.COM. Non-exhaustive lists of famous people who hold or have held amateur radio callsigns have also been compiled and published. Many jurisdictions (but not in the UK & Europe) may issue specialty vehicle registration plates to licensed amateur radio operators often in order to facilitate their movement during an emergency. The fees for application and renewal are usually less than the standard rate for specialty plates. In most administrations, unlike other RF spectrum users, radio amateurs may build or modify transmitting equipment for their own use within the amateur spectrum without the need to obtain government certification of the equipment. 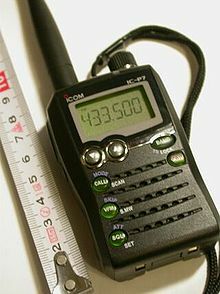 Licensed amateurs can also use any frequency in their bands (rather than being allocated fixed frequencies or channels) and can operate medium to high-powered equipment on a wide range of frequencies so long as they meet certain technical parameters including occupied bandwidth, power, and prevention of spurious emission. Radio amateurs have access to frequency allocations throughout the RF spectrum, usually allowing choice of an effective frequency for communications across a local, regional, or worldwide path. The shortwave bands, or HF, are suitable for worldwide communication, and the VHF and UHF bands normally provide local or regional communication, while the microwave bands have enough space, or bandwidth, for amateur television transmissions and high-speed computer networks. 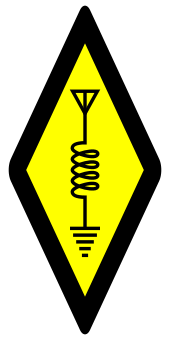 The international symbol for amateur radio, included in the logos of many IARU member societies. The diamond holds a circuit diagram featuring components common to every radio: an antenna, inductor and ground. In most countries, an amateur radio license grants permission to the license holder to own, modify, and operate equipment that is not certified by a governmental regulatory agency. This encourages amateur radio operators to experiment with home-constructed or modified equipment. The use of such equipment must still satisfy national and international standards on spurious emissions. Amateur radio operators are encouraged both by regulations and tradition of respectful use of the spectrum to use as little power as possible to accomplish the communication. This is to minimise interference or EMC to any other device. Although allowable power levels are moderate by commercial standards, they are sufficient to enable global communication. Lower license classes usually have lower power limits; for example, the lowest license class in the UK (Foundation licence) has a limit of 10 W.
Power limits vary from country to country and between license classes within a country. For example, the peak envelope power limits for the highest available license classes in a few selected countries are: 2.25 kW in Canada, 1.5 kW in the United States, 1.0 kW in Belgium, Luxembourg, Switzerland and New Zealand, 750 W in Germany, 500 W in Italy, 400 W in Australia, India and the United Kingdom, and 150 W in Oman. Output power limits may also depend on the mode of transmission. In Australia, for example, 400 W may be used for SSB transmissions, but FM and other modes are limited to 120 W.
The point at which power output is measured may also affect transmissions. The United Kingdom measures at the point the antenna is connected to the signal feed cable, which means the radio system may transmit more than 400 W to overcome signal loss in the cable; conversely, Germany measures power at the output of the final amplification stage, which results in a loss in radiated power with longer cable feeds. Certain countries permit amateur radio licence holders to hold a Notice of Variation that allows higher power to be used than normally allowed for certain specific purposes. E.g. in the UK some amateur radio licence holders are allowed to transmit using (33 dBw) 2.0 kW for experiments entailing using the moon as a passive radio reflector (known as Earth-Moon-Earth communication) (EME). The International Telecommunication Union (ITU) governs the allocation of communications frequencies worldwide, with participation by each nation's communications regulation authority. National communications regulators have some liberty to restrict access to these bandplan frequencies or to award additional allocations as long as radio services in other countries do not suffer interference. 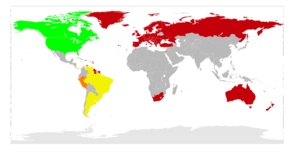 In some countries, specific emission types are restricted to certain parts of the radio spectrum, and in most other countries, International Amateur Radio Union (IARU) member societies adopt voluntary plans to ensure the most effective use of spectrum. In a few cases, a national telecommunication agency may also allow hams to use frequencies outside of the internationally allocated amateur radio bands. In Trinidad and Tobago, hams are allowed to use a repeater which is located on 148.800 MHz. This repeater is used and maintained by the National Emergency Management Agency (NEMA), but may be used by radio amateurs in times of emergency or during normal times to test their capability and conduct emergency drills. This repeater can also be used by non-ham NEMA staff and REACT members. In Australia and New Zealand ham operators are authorized to use one of the UHF TV channels. In the U.S., amateur radio operators providing essential communication needs in connection with the immediate safety of human life and immediate protection of property when normal communication systems are not available may use any frequency including those of other radio services such as police and fire and in cases of disaster in Alaska may use the statewide emergency frequency of 5167.5 kHz with restrictions upon emissions. Similarly, amateurs in the United States may apply to be registered with the Military Auxiliary Radio System (MARS). Once approved and trained, these amateurs also operate on US government military frequencies to provide contingency communications and morale message traffic support to the military services. Amateurs use a variety of voice, text, image, and data communications modes over radio. Generally new modes can be tested in the amateur radio service, although national regulations may require disclosure of a new mode to permit radio licensing authorities to monitor the transmissions. Encryption, for example, is not generally permitted in the Amateur Radio service except for the special purpose of satellite vehicle control uplinks. The following is a partial list of the modes of communication used, where the mode includes both modulation types and operating protocols. Most amateur digital modes are transmitted by inserting audio into the microphone input of a radio and using an analog scheme, such as amplitude modulation (AM), frequency modulation (FM), or single-sideband modulation (SSB). The following "modes" use no one specific modulation scheme but rather are classified by the activity of the communication. ^ "General Regulations Annexed to the International Radiotelegraph Convention" (PDF). International Radiotelegraph Convention of Washington, 1927. London: His Majesty's Stationery Office. 1928. pp. 29–172. ^ Sumner, David (August 2011). "How Many Hams?". QST. American Radio Relay League. p. 9. ^ Gernsback, H (May 1909). First Annual Official Wireless Blue Book of the Wireless Association of America (PDF). New York: Modern Electrics Publication. Retrieved 19 June 2009. ^ Brown, Patrick R. J. (1996). The Influence of Amateur Radio on the Development of the Commercial Market for Quartz Piezoelectric Resonators in the United States. 1996 IEEE International Frequency Control Symposium. 5-7 June 1996. Honolulu, Hawaii. doi:10.1109/FREQ.1996.559819. ^ "Inventor of IC 'chip', Nobel Prize Winner Jack S. Kilby Credits Amateur Radio for His Start in Electronics". Nobelprize.org. 20 June 2005. Retrieved 22 November 2012. ^ Jim Taylor. "Canadian Amateur Radio Bulletin, Amateur Radio "Saved Lives" in South Asia (2004-12-29)". Hfradio.net. Archived from the original on 6 March 2012. Retrieved 22 November 2012. ^ "What is Ham Radio?". ARRL.org. Archived from the original on 4 May 2010. Retrieved 1 June 2010. ^ Weaver, Bruce D. (January 2003). "On the Air Learning". Teaching Pre K-8. 33 (4): 50–51. ISSN 0891-4508. ^ "Ham Fisted", QST, August 1972, p83. ^ Brady, Jasper Ewing (1899). Tales of the Telegraph. Doubleday & McClure. OCLC 3421513. ^ "Ham Radio History". American Radio Relay League. Retrieved 17 April 2015. ^ Hall, L. C. (January 1902). "Telegraph Talk and Talkers: The Slang of the Wire". McClure's Magazine. Vol. 18 no. 3. p. 231. ^ Warner, Kenneth B., ed. (January 1920). "QST Subscription Contest". QST. Vol. 3 no. 6. American Radio Relay League. pp. 32–33. ^ "Ham Radio Frequently Asked Questions". ARRL.org. Archived from the original on 6 May 2010. Retrieved 23 May 2010. ^ "FCC Report and Order 06-178A1" (PDF). Federal Communications Commission. 19 December 2006. p. 7. Retrieved 16 May 2007. ^ Federal Communications Commission (24 January 2007). "47 CFR Part 97" (PDF). Federal Register. Washington, D.C.: Government Printing Office. 72 (15): 3081–3082. Retrieved 18 December 2007. ^ "FCC to Drop Morse Testing for All Amateur License Classes". ARRL.org via UnwiredAdventures.com. 15 December 2006. Retrieved 17 May 2010. ^ "KH6BB USS Missouri Radio Room Photos". KH6BB USS Missouri Battleship Radio Room, kh6bb.org. Retrieved 23 May 2010. ^ Valdes, Robert (9 May 2001). "HowStuffWorks: Use of VoIP in Amateur Radio". Communication.howstuffworks.com. Retrieved 22 November 2012. ^ Taggart, Ralph E (April 1993). "An Introduction to Amateur Television" (PDF). QST via ARRL.org. pp. 19–23. Archived from the original (PDF) on 5 June 2007. ^ Holmstead, Stephen (30 December 1994). "Amateur Satellite FAQ". The Radio Amateur Satellite Corporation. Retrieved 14 March 2010. ^ Taylor, Joe (December 2001). "WSJT: New Software for VHF Meteor-Scatter Communication" (PDF). QST via ARRL.org. pp. 36–41. Archived (PDF) from the original on 28 January 2010. ^ "ARISS: Amateur Radio on the International Space Station". ARRL.org. Archived from the original on 11 January 2007. Retrieved 10 January 2007. ^ Jurrens, Gerald. "Astronaut (and Former Astronaut) Hams". gjurrens at Tellurian.com. Archived from the original on 30 December 2006. Retrieved 10 January 2007. ^ Haag, Jerry. "Principles of Amateur Radio Net Control". SCC-AREA-RACES.org. Retrieved 10 January 2007. ^ "Amateur and Amateur-satellite service". International Telecommunication Union. Archived from the original on 22 August 2010. Retrieved 16 August 2010. ^ brweb (1 May 2000). "International Telecommunication Union, Minimum Qualifications For Radio Amateurs". Itu.int. Retrieved 22 November 2012. ^ 鲍沁勇、徐璟华、林森 (2017). "见证共和国业余无线电发展的人：专访童晓勇/BA1AA". CQ现代通信 (in Chinese). No. 2017第2期. 北京博趣出版有限责任公司. p. 65. ISSN 1000-6559. ^ "Amateur radio licensing in Thailand – sect. Equipment license". The Radio Amateur Society of Thailand 7 August 2010. Archived from the original on 26 February 2011. Retrieved 13 February 2011. ^ a b c "Amateur Licensing Examinations". Federal Communications Commission. ^ "285 TechConnect Radio Club". Na0tc.org. Archived from the original on 15 March 2015. Retrieved 22 November 2012. ^ "ARRL Mentor Program". ARRL.org. Archived from the original on 14 October 2007. ^ Wilson, Mark J; Reed, Dana G (2006). The ARRL Handbook for Radio Communications 2007 (84th ed.). Newington, CT: American Radio Relay League. ISBN 0-87259-976-0. ^ "Amateur Radio (Intermediate) License (A) or (B) Terms, Provisions and Limitations Booklet BR68/I". ^ "Amateur Radio (Intermediate) License (A) or (B) Terms, Provisions and Limitations Booklet BR68/I". Ofcom.org.uk. Retrieved 2 June 2007. ^ "Common Filing Task: Obtaining Vanity Call Sign". FCC.gov. Retrieved 2 June 2007. ^ "Vanity Call Sign Fees". ARRL.org. Retrieved 28 September 2015. ^ "UK Amateur Radio Call Signs (callsigns)". Electronics Notes. 2016. Archived from the original on 17 October 2016. Retrieved 17 October 2016. ^ "License Search". Universal Licensing System. US Federal Communications Commission. Archived from the original on 22 August 2010. Retrieved 29 August 2010. ^ "Famous Radio Amateurs 'Hams' & Call Signs". Bedworth Lions Club. Retrieved 29 August 2010. ^ a b "ARRL Web: Amateur Radio License Plate Fees". Archived from the original on 4 August 2007. ^ "Ham Radio Callsign License Plates (Canada)". Archived from the original on 7 December 2008. Retrieved 4 December 2008. ^ "ICBC – HAM radio plates". Archived from the original on 19 October 2008. Retrieved 3 December 2008. ^ "FCC.gov, About Amateur Stations. 'They design, construct, modify, and repair their stations. The FCC equipment authorization program does not generally apply to amateur station transmitters.'". Wireless.fcc.gov. 19 February 2002. Retrieved 22 November 2012. ^ "Australian Radio Amateur FAQ". AMPR.org. 24 June 2006. Archived from the original on 18 July 2008. ^ "FCC Part 97 : Sec. 97.313 Transmitter power standards". W5YI.org. Retrieved 27 August 2010. ^ Industry Canada (September 2007). "RBR-4 – Standards for the Operation of Radio Stations in the Amateur Radio Service, s. 10.2". Government of Canada. Retrieved 21 January 2013. ^ "FCC Part 97 : Sec. 97.401 and 97.403 Emergency Communications". Retrieved 21 June 2012. Bertrand, Ron; Wait, Phil (2005). Your Entry Into Amateur Radio: The Foundation License Manual (1st ed.). Wireless Institute of Australia. ISBN 0-9758342-0-7. Cleveland-Iliffe, John; Smith, Geoffrey Read (1995). The Canadian Amateur Study Guide for the Basic Qualification (5th ed.). 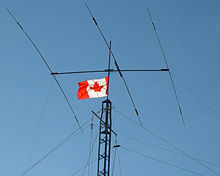 Radio Amateurs of Canada. ISBN 1-895400-08-2. Shaji, P. B. (2013). "Introduction to Amateur Radio". HamRadioIndia. Betts, Alan (2004). Foundation License Now! (3rd ed.). Radio Society of Great Britain. ISBN 1-872309-80-1. Wolfgang, Larry D., ed. (2003). Now You're Talking! All You Need For Your First Amateur Radio License (5th ed.). American Radio Relay League. ISBN 0-87259-881-0. Hennessee, John, ed. (2003). The ARRL FCC Rule Book (13th ed.). American Radio Relay League. ISBN 0-87259-900-0. Silver, H. Ward (2004). Ham Radio for Dummies. John Wiley & Sons. ISBN 0-7645-5987-7. Bergquist, Carl J. (May 2001). Ham Radio Operator's Guide (2nd ed.). Indianapolis: Prompt Publications. ISBN 0-7906-1238-0. Dennison, Mike; Fielding, John, eds. (2009). Radio Communication Handbook (10th ed.). Bedford, England: Radio Society of Great Britain. ISBN 978-1-905086-54-2. Haring, Kristen (2007). Ham Radio's Technical Culture. Cambridge, MA: MIT Press. ISBN 0-262-08355-8. Poole, Ian D. (October 2001). 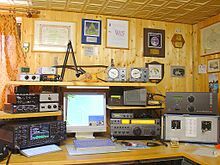 HF Amateur Radio. Potters Bar, Hertfordshire, England: Radio Society of Great Britain. ISBN 1-872309-75-5. Rohde, Ulrich L.; Whitaker, Jerry C. (2001). Communications Receivers: DSP, Software Radios, and Design (3rd ed.). New York City: McGraw-Hill. ISBN 0-07-136121-9. The ARRL Handbook for Radio Communications 2010 (87th ed.). Newington, CT: American Radio Relay League. November 2009. ISBN 0-87259-144-1. Wikimedia Commons has media related to Amateur radio.